My friend builds nuclear reactors, and didn't want to spend a small fortune at MIT's Central Machine Shop getting parts modified, so I offered to help him out. You can read more about his crazy projects on his blog. 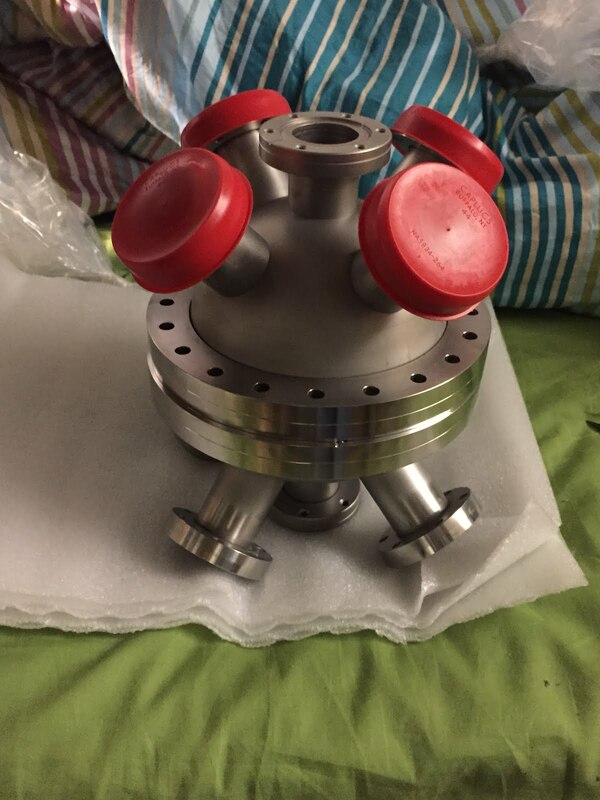 I started this project with access to none of MIT's machine shops, so I could only work at MITERS, the only shop on campus that's open to absolutely anybody. All the other shops required safety training, or thought the parts were too complicated. 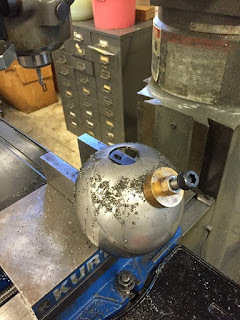 I didn't have access to a boring head or a chuck large enough to hold the sphere, so I had to get clever with a rotary table. 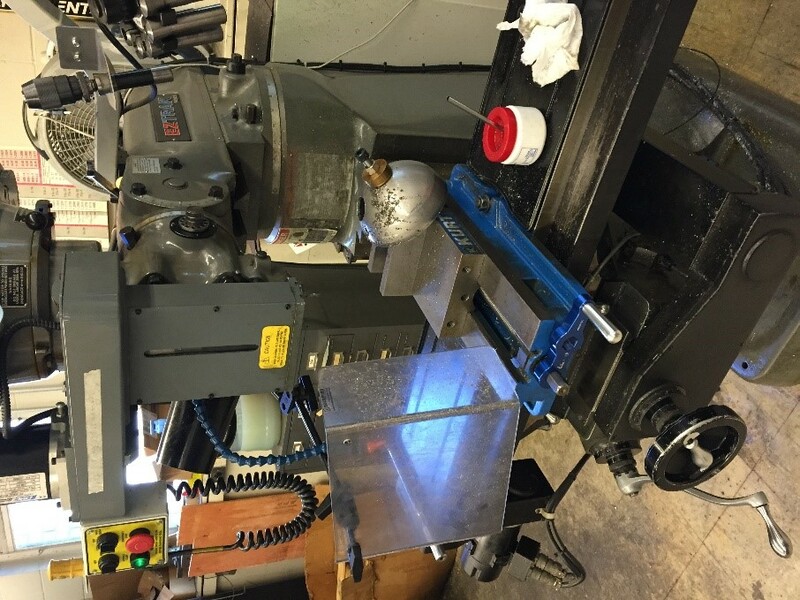 The first step was to align the axis of rotation of the rotary table with the center of the rectangular stock. 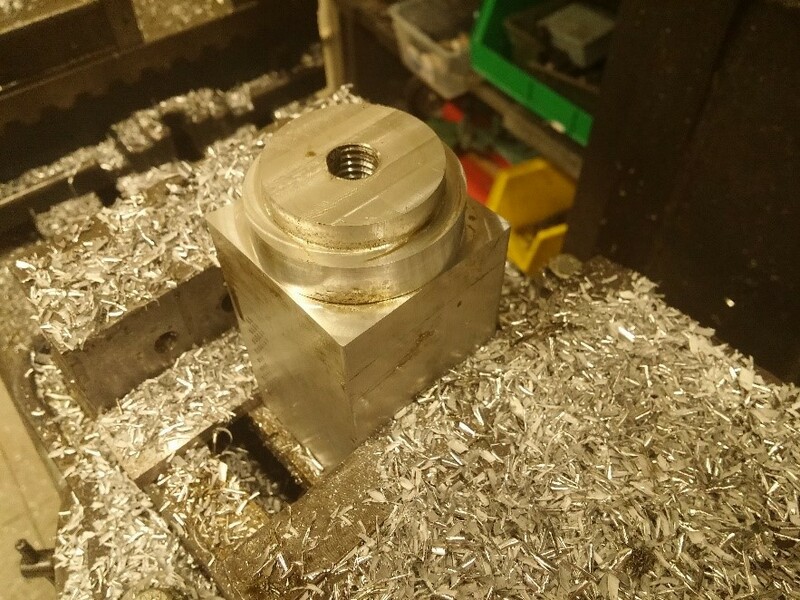 To make it easier, I put a collet block with the same thickness as my stock in the vise and dialed that in. The vise didn't quite fit on the rotary table, so one bolt (not shown) goes through a slot in the middle of the vise with a bunch of washers. Once the block was in the right spot, I used an indicator in the spindle to set my zero on the DRO as the center of the collet block. 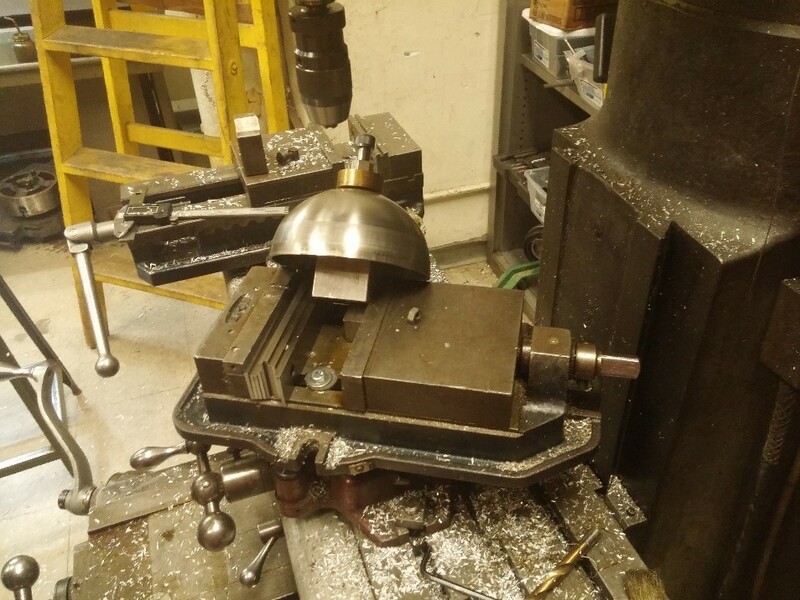 The fixture I made has a circular edge that rests on the inside of the hemisphere and a tapped 1/2-13 (same as typical Bridgeport hold down) hole for bolting the hemisphere down. This single bolt attachment was a little sketchy, but I never had any trouble with the part moving. I first tried to put a hole in the center of the hemisphere with one of the MITERS center drills. 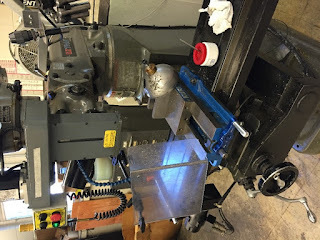 Unfortunately it was very dull and caused work hardening even with a lot of force – I was worried I would break the tip of the center drill if I pushed harder. In the end, I used a 3/8” 3 flute carbide end mill with a small corner radius in the lathe tailstock, but a sharp center drill would work too. Next, I bolted the hemisphere to the fixture and set it up in the vise with a 45 degree angle block. Indicating the sphere was frustrating because the hemisphere was not perfectly spherical. When rotating around any diameter of a sphere, the indicator should not move, but I was seeing .01” maximum deviation near the edges. 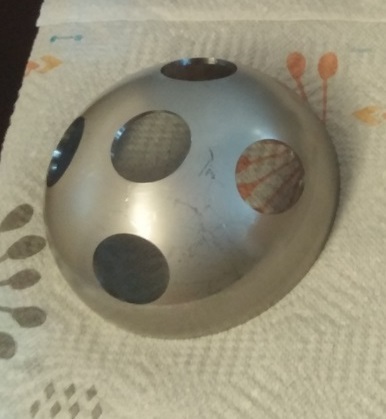 I also didn’t see the typical high/low pattern that normally appears with a spherical/cylindrical part being turned eccentrically, meaning the sphere must have some weird distortion. The hemisphere appears to be formed, so this isn’t too surprising. I found it useful to put a 1/2" diameter steel rod in the drill chuck and line up the sphere so that the plane of the bottom of the rod is tangent with the sphere to get an approximate location of the sphere before using the indicator. -Notice the bolt holding down the vise! The hemisphere is a terrible shape for ringing and chatter, so I had to go quite slow. I found that at a certain feed rate the part would make a pleasant ringing noise similar to a tuning fork. I was using one of my end mills – MITERS had nothing that could cut stainless. I used a ½” carbide six flute coated end mill. I was taking .05” to .10” wide passes at 1100 rpm and around 3 ipm or so. The chips created were sharp and got stuck in my hands, which was very annoying. The finish left behind was quite good. 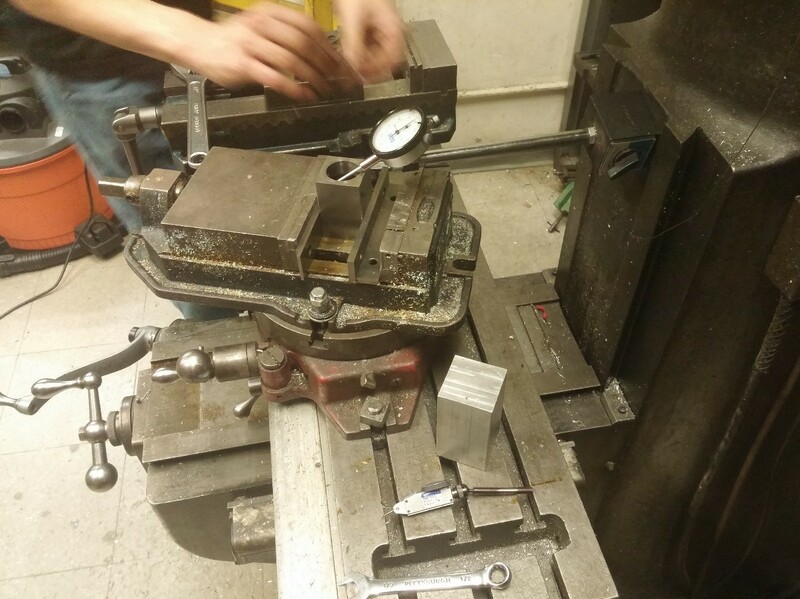 Once I had one hole done, I walked in to the Edgerton Student Shop, which has nice equipment, and asked if I could continue machining the part there. After showing the instructor there that I was able to make one of the holes, they were much more willing to let me work there. The guy there did not like my fixture, so he suggested that I use a very small end mill to reduce cutting forces. I used a 3/16” 3 flute carbide end mill to make a .01” undersize hole first using a CNC ez-trak Bridgeport. It was one of the fancy 3 axis ones that had a canned helix cycle, so I set it up to continuously ramp down as it cut the circle. I used a .04” deep cut at 6 IPM. It was completely happy slotting at this depth, but sometimes chattered before the cutter was fully engaged. As I did more holes I cheated it down so the cutter would be fully engaged sooner. I got a great surface finish with a .005” wide finish pass at full depth and 8 IPM.